Steve Ray joined Jerry Usher on Catholic Answers Live for Open Line Q & A at 6 PM EST Thursday, June 8, 2006. Click here to listen to the archived show. If it does not play when you click on it, you may need to download the free RealAudio Player. Click here for more info and other listening options. My husband is not Catholic; am I unequally yoked and what should I do? My wife was sexually abused by her father and now wants nothing to do with God; what should I do? Is the God of the OT different from the God of the NT? Is it legitimage to bury a statue of St. Joseph when buying or selling a house? Many of my Catholic friends have been sterilized and I am considering a vasectomy. Did Jesus dishonor his mother in Cana when he said, "Woman, what is that to you and me?" Want to search the web using the best search engine? 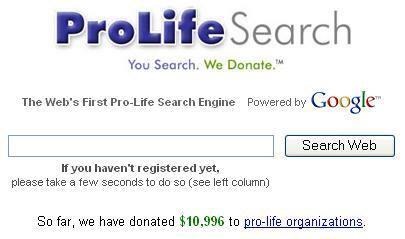 Want to donate money to ProLife causes every time you search the web? Then take 2 seconds to sigh up for the Google ProLife Search Engine! Click on the image to go straight to Google ProLife!